To communicate via Real Time Transfer (RTT), connect your development board via USB and run the J-Link RTT Viewer. 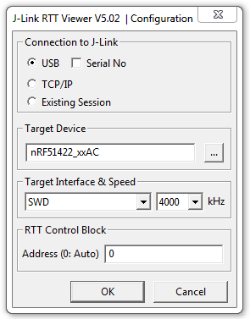 Note: SEGGER Embedded Studio (SES) natively supports RTT. If enabled, the monitor shows up when you start debugging. Alternatively, you can use SEGGER's J-Link RTT Viewer as described below. The J-Link RTT Viewer is installed as part of the nRF5x Command Line Tools. Select the correct target device. The target device is represented by the ID of your development board. Select SWD as the target interface.